Love my shark. I’ve had two previously And I love them. 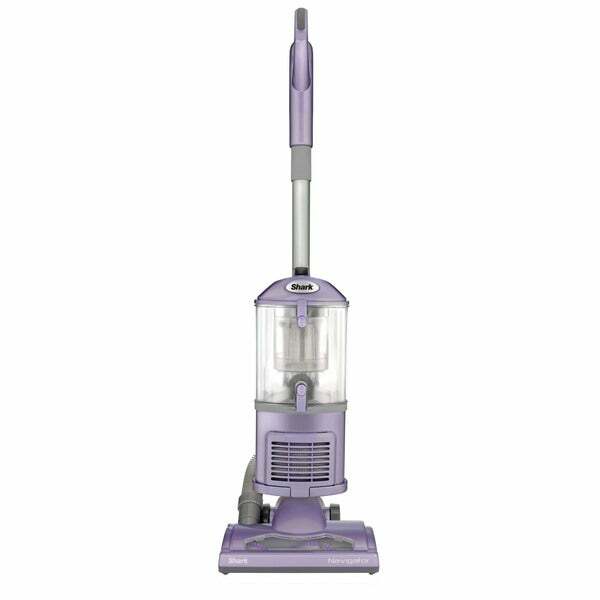 They are a great option for people who want a great vacuum at a very reasonable price. I am rough on vacuums as I have two dogs and I vacuum at least daily so it gets a lot of use. It holds up and is a bargain for the cost. Lightweight and powerful, this Shark Navigator Lift-Away Upright Bagless Vacuum is perfect for all of the surfaces in your home. The vacuum features a variety of attachments, perfect for handling pet hair, upholstery, and hard-to-reach areas of your furniture. The bag-free design allows you to quickly and easily empty the contents, and the swivel steering offers superior maneuverability for better cleaning. Receptacle capacity of 3 qts. I love this vaccum cleaner. I have three large dogs, all with long hair. I've had the Shark for a little over a month now, and it is dealing with the hair just fine. I like the way it easily transitions from carpet to bare floors. If I could change one thing, it would be the way the cord comes from the device; it's a little awkward, and I have to remember to hold the cord or I am quickly tangled. It is easy to empty, and the cord is plenty long enough. This is a light vacuum, which is easy to maneuver. This is the second Shark Navigator vacuum I've bought (first one was the NV22L about 6 years ago). I bought this to replace the old model because the old one got a lot of use and got beat up over the years, but the suction and everything was still in great shape. Anyway. This vacuum comes well packaged and unassembled. The good thing is that most of the parts are easily put together without really having to look at the instructions. Some models come with extra parts, as depicted by the box, so we thought we were missing some pieces when we really weren't. We gave it a whirl this weekend. It's super quiet over hard wood floors. Big fan of the swivel to be able to maneuver better under sofas and the like. The "2" setting with roller really goes to town on the carpet and doesn't miss anything. We have wool rugs and all the fibers just got vacuumed up. I also used the pet brush on our couch and two upholstered chairs (that our cat has taken throne to) and it worked great. I was excited about this model because of the "lift away: feature because I like to be able to reach things like the ceiling. Maybe it's because I'm so used to the other vacuum's wand, but this handle didn't feel as ergonomical as I thought it would be. You have to hold it from the curved handle and it was a little bothersome when cleaning stuff higher toward the ceiling. That is probably something I need to learn how to get used to, but it was my initial reaction. Also, the power cord does not seem as long (was only able to reach half the room before having to find another outlet), and the vacuum hose is kind of short (but I guess the trade off is the lift-away feature). I have a Oreck and a Dyson sweeper and this sweeper cleaned the carpet better than both of the others! My carpet is thick and the one in my bedroom was especially hard to get embedded lint, from one of my blankets that sheds really bad, vacuumed off of the carpet. The Dyson did a very poor job at getting it done. The Oreck was a little better, but still left the lint behind. I was so tired of my carpet looking bad with all of the embedded lint that I decided to give this one a try. It did a wonderful job of cleaning it all out of the carpet! It grooms the carpets very nice. I'm glad I made the decision to get the Navigator! My Dyson is now in the upstairs part of the house and the Navigator cleans all of the main floor and does a great job. Excellent suction. Easy to control suction via the suction control dial so that you can easily clean small area rugs without them moving or getting sucked up. Cleaning path smaller than what I was used to, but actually nice so that I can clean easily between side tables and couch without having to move furniture around. Style allows you to reach well under tables and beds further than other brands, models I've owned. Our carpet really fluffed up after using this and remained not looking flat much longer between cleanings. The turbo brush is much, much better than others I've owned - it is wider and more powerful and the stairs look great. this is my go to brand when i need a new vacuum. i love the bagless feature and no loss of suction. i have pets and shark vacuums do the trick. This vacuum is great on carpets, not so great on bare floors. It is easy to clean and all in all I am happy with this purchase. Purchased Shark NV352 Navigator Lift-Away Vacuum because my old vacuum did not pick up the cat hair from my carpet anymore. The Shark Navigator makes quick work of the cat hair and makes my life easier because of the ease of cleaning. Also easy to remove & clean the canister. I've had this vaccum for 2 years and will never use another type of vaccum. I would buy this again except mine is still working like a charm. Think your rugs are clean, use this little guy and feel amazed. I own a shark. My son went to college and needed a vacuum. I ordered one from overstock and he got in three days. He is in love with it. The suction on the vacuum is powerful. I just received it and have only used it twice but so far so good, and I am very pleased. When canister is opened in order to empty contents, the debris does not "fall" out so easily as shown in video. You may need to "help" remove it, if you catch my drift. I bought my shark after reading all the online reviews.... I should have just bought a Dyson! I have had my Shark for about 1 1/2 years. I have never been happy with the size of the dust/dirt collection bin, extremely small for those of us with multiple pets. Today, final straw -- I discovered multiple holes in the the hose that connects the base unit to the vacuum. Very disappointed Shark would not replace it -- they offered to send the hose... but I am not exactly the handy type and don't have hours to try to play fix it. Nice vacuum works great but hard to push on a shag rug! Love this vacuum! I purchased one for my parents as well. Just what I was looking for to replace my Dyson. Excellent smaller size and lighter weight..Love the swivel feature and the lift-away, bag less dirt container. Would recommend this vacuum. cleaner. Great vac gets the job done, easy to handle. Good suction. Cleans well. Lightweight . Great price. Love my Shark products! Their vacuums amaze me with the pulling capability and how well it cleans up my pug’s fur. Way less allergies here using this vac! Love this Shark, I live in the country and we don't take our boots/shoes off coming in and out. We track in all kinds of stuff. One quick push over the run and it looks great every day!! Love this vacuum cleaner! This the second one I've bought, (this one is for a rental property). I have two dogs and a messy husband and it works great. Love that it works on wood and carpet. Easy to clean, then ready to go again. I would definitely buy again! Great basic vacuum for a low price. I have three large dogs, one of whom sheds heavily, and bought it based on reviews from other pet owners. It hasn’t let me down! Gets my floors and upholstery clean and is easy to handle. It’s made of brittle plastic so I’m a little worried about parts breaking from a fall, but so far not a single issue. I have a dog with very long hair and this vacuum works very well. The only issue I have with this one, is you can't get to the roller very easy. You have to cut the hair from around the roller to get it out. "Does this vacuum cleaner fit under beds? Dressers, etc. " Depending on the size of the bed or dresser, it may fit partially under. "I have a bad back is it heavy I need a light one that’s easy to use"
Upright Bagless Vacuum is approximately 20.5 lbs in weight. "I'm seeing a decent amount of price difference on other sites, do you all price match?" Sorry I have not and I did not at the time that I purchased this for my son. "where di i get it serviced in auckland nz, i need a hose repaired"
For assistance with this issue please contact Customer Care at the number below. 00-1-801-559-3816. "The 360 model has 1200 watts. How many watts in this model?" The Shark NV352 Navigator has 1200 watts also. "I purchased this in June and I'm now having problems. How do I get my vacuum repaired?" Hello Virginia W., you will be contacted by Customer Care. Have a great day. Hello rose1029, it is not self propelled; however, it is very easy to maneuver and lightweight. Thanks for shopping with us!